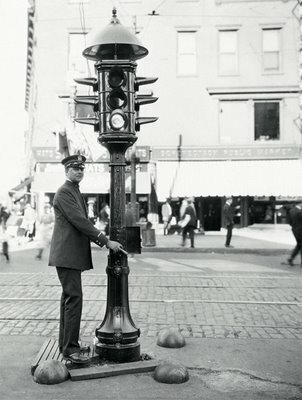 The first traffic light was installed in Cleveland in August, 1914. America’s first electric traffic light made it’s debut at the intersection of E. 105th and Euclid in Cleveland, Ohio on August 5th, 1914. The traffic light was installed by the American Traffic Signal Company and had only red and green lights as well as a buzzer to notify drivers when the light was about to change colors. The traffic light was operated by a traffic officer in a nearby booth. The traffic officer operating the light was equipped with an emergency communications device which allowed him to be constantly in touch with police and firemen. Check out this article from the August 1914 issue of The Motorist which instructs drivers on how to obey the lights. When a driver wanted to make a left-hand turn onto another street, they were instructed to enter the intersection and move to the “extreme right” so other drivers behind them may pass. When the buzzer sounded, left-turners were permitted to cross the intersection and proceed with the turn. Aren’t you glad we have turning lanes these days? Six years later, the first four-way, three-color traffic light was created by a police officer in Detroit, Michigan. The site of the first traffic light is now home to the Cleveland Clinic Foundation campus and is close to Wade Park, Case Western Reserve University and University Hospitals – an appropriate place for the site of the transportation industry’s first electric device promoting health and safety.